The stories persist among aboriginal tribes throughout the islands of the Pacific and along the Pacific Rim. The people appear to have a subconscious memory of a great civilization that once existed on a large island continent which, like Atlantis, disappeared under the sea. Some believe that the early known "natives" of the Americas, who were here before the Europeans began moving into the area, may have been survivors of Mu. They also are found on remote places in the Pacific like Easter Island and the Indonesian Archipelago. This mythological continent was given another name, Lemuria by zoologist Philip Sclater in an 1865 writing for The Quarterly Journal of Science. He theorized that a large land mass must have been responsible for the fact that fossils lemurs were found in both Madagascar and India. The strange carved rock statues of Easter Island and other artifacts uncovered there suggested that the island may have once been part of Mu. And the Maori people of New Zealand speak of a legend that their ancestors came there many years ago from a sinking island, a vast mountainous place on the other side of the water. Recent exploratory work on the ocean floor has revealed evidence that a large land mass once existed millions of years in the past. The research vessel JOIDES Resolution found the remains of pollen and wood fragments in sea floor sediment in the Indian Ocean in 1999. Divers off the coast of Japan discovered the remains of large cut rock structures. Writers like Helena Blavatsky, Thomas Lake Harris, Louis Jacolliot, William Scott-Elliott and Charles Webster Leadbeater all promoted the concept of the lost continent of Lemuria in their published works. And Earnst Heinrich Haeckel, a German naturalist who promoted Darwin suggested that the missing link in the human evolutionary chain might be located on what was once the continent of Lemuria or Mu. It was James Churchward, an American explorer, who excited the imagination of many with his books that spoke of The Lost Continent of Mu. He theorized that the continent was so large it included the Hawaiian Islands, Fiji, Easter Island and the Marianas. Churchward published five books on the subject between 1926 and 1931. He theorized that Mu boasted a once advanced civilization that lived about 60,000 years ago before the land sank into the sea. Drunvalo Melchizedek, a contemporary author and spiritual teacher, claims that he was in communication with two angels that gave him visions of the ancient past. 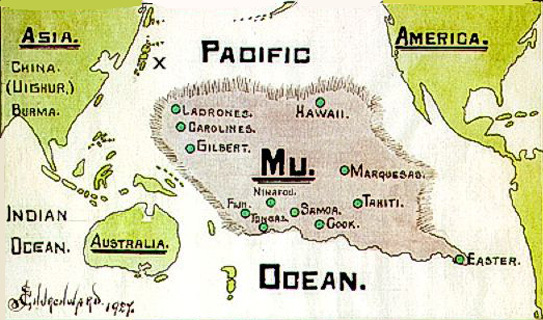 He believes Mu was a separate continent that existed before Lumeria. About 64 million people perished when a series of extreme volcanic eruptions destroyed that continent. The first great continent that existed on Earth was Gondwanaland, a solid block of land that later separated by sliding plates into smaller continents. Lemuria was not a solid mass of land, but a series of thousands of islands that were closely linked. People lived on Lumuria for about 70,000 years and developed an extremely advanced mental and physical form of existence. But the island chain, which was almost a continent, was destroyed by a pole shift. Melchizedek was told that the people had time to escape and fled to all parts of the Earth. They mostly settled in South and Central America, from Lake Titicaca through Mexico and north to Mount Shasta. The ruins in those parts of the world were left by the people of Lemuria. When Lemuria sank, the land mass that became Atlantis then rose, he said. You can get much more information about Melchizedek’s stories if you can find his two-volume work, The Ancient Secret of the Flower of Life."